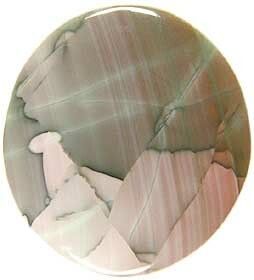 Imperial Jasper is a popular material that has lots of variation in color, pattern and character. The name says it all, this is a top quality jasper and our Imperial Jasper is hand selected. We have some wonderful Spiderweb Imperial Jasper and the more typical Imperial Jasper with orbs and swirls. 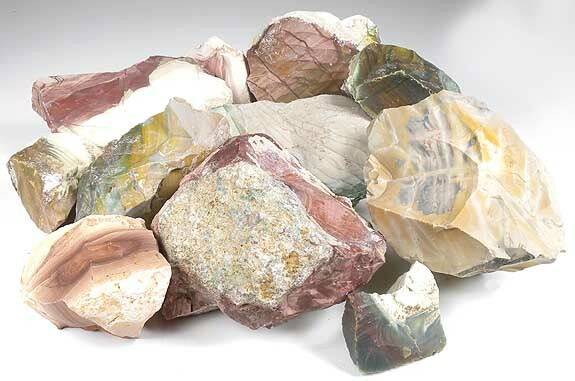 Imperial Jasper polishes well with diamond, cerium or tin oxide. Mohs hardness 7. Imperial Jasper#2 Triangular shape measures approximately 5-1/2" x 4" x 2-7/8 to 1-1/2" thick. Unusual purplish and mustard coloring! Imperial Jasper#3 Measures approximately 3-1/2" x 3" x 3" at the thickest place. Unusual mix of greens and browns with nice green stripes and some brown orbing. 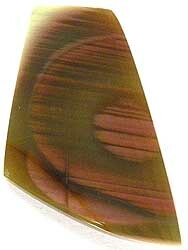 Imperial Jasper#5 Triangular shape measures approximately 5-1/2" x 4" x 2-1/8" at the thickest point. Mauves, creams and whites with some spiderwebbing! Imperial Jasper#7 Measures approximately 3-1/4" x 3" x 3" at the thickest point. Has mauves, browns tan and greens! Imperial Jasper#8 Triangular shape measures approximately 5-1/2" x 3-1/2" x 2-1/2" thick. Has reds, mauves, and pink. Beautiful slabber! Imperial Jasper#9 Measures approximately 5-1/4" x 3" x 2-3/4" thick. Has mauves and pinks. Landscape to spiderweb patterns! Imperial Jasper#11 Measures approximately 4-1/4" x 2-3/4" x 1-1/2" at the thickest point. Has greens, browns tan with some spiderwebbing! Imperial Jasper#12 Measures approximately 3-1/4" x 2" x 1-1/2" thick. Has reds, mauves, and beautiful pinks. Imperial Jasper#13 Two-piece parcel measures approximately 2-3/4" x 1-3/4" x 2 to 1-1/2" thick. Cream in color and has lines of green spiderwebbing. Should cut nice bulls eyes! AND 4" x 2" x 1" at the thickest point. Light khaki color with dark green lines. We also have SLABS of Imperial Jasper!